Like every year around this time, the Ottawa Tibetan community said goodbye to a group of bright young Tibetans who came to stay with us for 2 months. 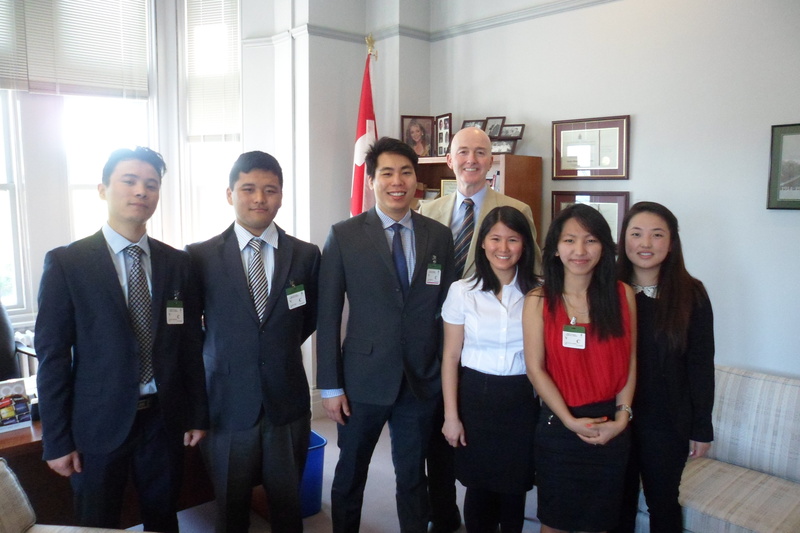 Under the leadership of Canadian Member of Parliament and Chair of the Parliamentary Friends of Tibet (PFT), David Sweet, the PFT internship program successfully completed its 4th round, with 6 young Tibetans from across Canada taking part in the program this year. The participants had to go through a vigorous interview process to be hired into the offices of 6 Members of Parliament across various political parties. While here, the interns worked in the offices of these parliamentarians for 7 weeks, learning about the Parliamentary system and gaining experience for their own futures – all the while representing Tibet at Parliament. The interns even hosted a lunch reception for their bosses, making momos, chow mein, and bhoejha, introducing to them Tibetan culture. The interns broadened their Canadian Parliamentary knowledge by attending Parliamentary proceedings, meetings, and social events. They also learned more about Canada by visiting numerous national museums in the nation’s capital. Internship organizers also aimed to teach Tibet to the interns while they were here, organizing meetings with Tibetan Parliament Chitue for North America Norbu Tsering la, Kate Woznow – International Director of Students for a Free Tibet, Tenzin Choedon – Outreach Coordinator of Tibet Action Institute, and Kasur Tashi Wangdi la – former representative of HH Dalai Lama to North America (among many other past roles). Organizers hope to continue this internship again next year and into the future. I continue to be impressed each year by the quality and level of professionalism and ‘semshook’ of the interns – this year’s interns really stepped up and took advantage of all opportunities to teach Tibet at Parliament to those in decision-making roles in our government, so I hope this program will be attended by more and more young Tibetans and obtain the support of more Tibetan organizations since there is undoubtedly capacity for growth of this program if there is the demand from our side. Below you’ll find information about this year’s participants, as well as some photos illustrating their experience. I’d also like to share that one of the interns was even offered a full-time job in their office for the remainder of their summer until they return to school in the fall – so we’ll continue to have some extra Tibet representation at the Hill for a little while longer! Congratulations and thank you to all participants this year, you’ve made us all extremely proud! Tashi Kashi was born and raised in Montreal, Quebec, and is currently attending the University of Concordia, working towards a B.A. Economics and B.A. History. He also completed Liberal Arts at Champlain College. Tashi interned for M.P. Élaine Michaud (Portneuf-Jacques-Cartier). Tenzin Khyentse was born and raised in India. He completed high school at the Tibetan Children’s Village in Dharmsala, India. He completed his Bachelor of Computer Application degree from Bangalore. As a student in Bangalore, he served as the General Secretary for the regional chapter of Tibetan Youth Congress. He interned for the office of M.P. Wladyslaw Lizon (Mississauga East-Cooksville). Kelyang Tenzin was born in India and immigrated to Canada in 2002. She is attending Ryerson University for a Bachelor of Science in Nursing, expecting to graduate in 2016. She interned at the office of M.P. David Sweet (Ancaster-Dundas-Flamborough-Westdale). She is a member of Students for a Free Tibet Toronto and President of Student for a Free Tibet Ryerson for the academic year of 2013-3014. Chungtak Tsering was born in Nepal and moved to Canada with her family in 2007. Currently, she is completing her Bachelor of Commerce degree in Business Management program at Ryerson University. She also serves as a Board member for Students for a Free Tibet Canada. She interned at the office of M.P. Rob Anders (Calgary West). Rignam Wangkhang was born and raised in Belleville, Ontario. He has just graduated with a Bachelor of Arts with Honours from Queen’s University in Political Studies. He currently serves as a Board Member of Students for a Free Tibet Canada and will be teaching rural Tibetan students in Amdo with Machik as a Summer Enrichment Program Teacher. Rignam interned for the Honourable M.P. Tony Clement, President of the Treasury Board. Tenzin Wangmo attended Tibetan Children’s Village in Dharamsala, India and completed her high school education at Parkdale Collegiate Institute in Toronto. She is currently attending the University of Toronto, completing her Bachelor of Arts. Wangmo interned in the office of M.P. Peggy Nash (Parkdale-High Park).